First Jewish senior wrangler; born in London May 20, 1846; died June 19, 1871. At Pinches' Commercial School and afterward at University College School he gained all the principal prizes. In 1862 he obtained the Jews' Commemoration Scholarship at University College, London, and was twice awarded the Andrews' Scholarship. He matriculated at London University in 1862, obtaining honors wholly without precedent there. 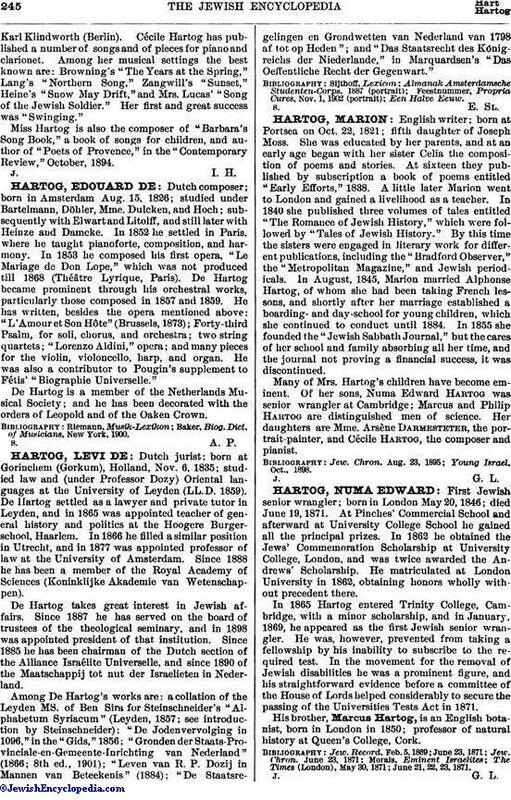 In 1865 Hartog entered Trinity College, Cambridge, with a minor scholarship, and in January, 1869, he appeared as the first Jewish senior wrangler. He was, however, prevented from taking a fellowship by his inability to subscribe to the required test. In the movement for the removal of Jewish disabilities he was a prominent figure, and his straightforward evidence before a committee of the House of Lords helped considerably to secure the passing of the Universities Tests Act in 1871. His brother, Marcus Hartog, is an English botanist, born in London in 1850; professor of natural history at Queen's College, Cork. The Times (London), May 30, 1871; June 21, 22, 23, 1871.